"There's really not much going on right now," noted Canada Post spokesperson John Caines in a phone interview yesterday. 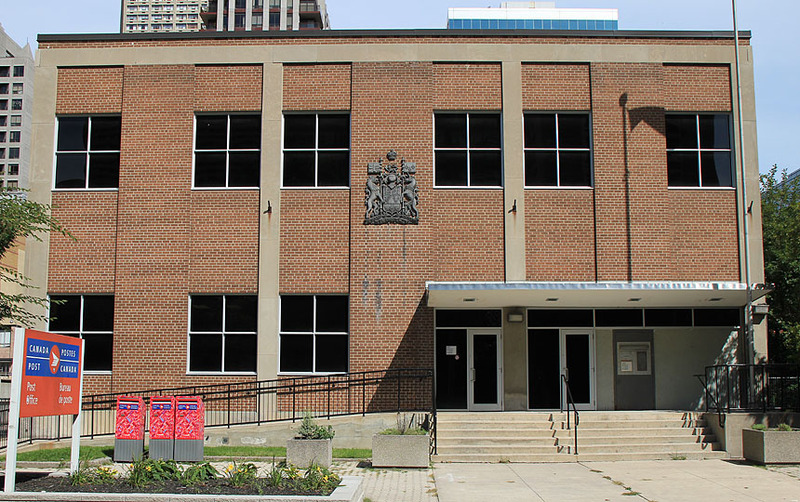 An RFP (request for proposals) was made in April for Postal Station K, along with Canada Post properties at 50 Charles Street East and 1780 Avenue Road. "We're considering selling them, but only if the purchaser provides a suitable replacement property or properties in return. We're not looking to leave the area but upgrade and modernize our network." I see two Casa penthouse people are selling, one facing south & east, eventually into CHAZ, the other facing west and north, eventually into Casa 2. If the post office property is developed I hope that's the end of development for Charles St. East, all that's left are a few homes, a small church and a couple of walkup apartments which all fit together nicely. Not sure what these guys are up to but they recently blacked out all the windows on this post office. When you walk up to the doors you can't even see if someone is exiting. It's a very unfriendly and mystifying treatment of a public building and does nothing to help their declining business. Privacy concerns maybe? I always hate it when nozy ppl spy on me when I'm working. I'm thinking Casa 3 here would be great. 50s at 50 Charles East? Perfect. ^ I pray that never happens. It's been like that for over a month. I went to pick up an Amazon.com package in late June, maybe early July and it was like that then. I was also unhappy because it was a Friday afternoon and I got there a few minutes after 5:30, about 10 minutes before it was to close, and they were already closed so I couldn't get my blu rays until Monday. Casa 3 Condos coming here?! This was not unexpected, but for god's sake, I hope they depart substantially from the design of Casa and Casa II this time. Agree. With so many brick, stone buildings coming down on Charles East to make way for glass, the last thing this strip needs is more glass. Could just be a real estate agent or online guy parking a name in the hope of reselling later. No. Cresford used godaddy to register casa2condominiums.ca as well. In addition, Casa3Condomimiums.ca, casa3condos.ca, casa3condos.com and casa3.ca were registered on the same day. From my experience/observations, real estate agents are too cheap to register so many domain names related to a development and esp protected registration. There hasn't been a recent sale on this site yet as far as I can tell. Its still owned by the gov.